The most critical features in military applications are reliability and performance. 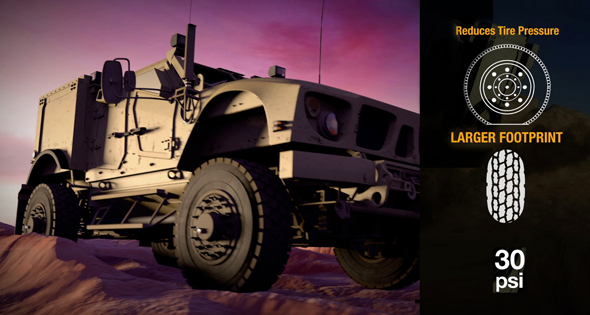 Our industry-proven Spicer® Central Tire Inflation System (CTIS) for the military vehicle is designed to enhance government defense vehicles with significantly improved all-wheel drive performance, maximum mobility, and full diagnostics. A “limp home” feature prevents disabled military vehicles on the battlefield and in other instances of major tire leaks. From complete mobility optimization and remote wheel-end venting to sealed wheel valves that prevent environmental contamination, Dana’s engineers designed this Central Tire Inflation System to transport, deploy, and recover faster.